A great university is not one that is renowned for its ability to teach, but is one that is great from its ability to teach, mentor and generate new knowledge. Realistically it means that it is not good enough to teach the world’s best ideas to young minds, but of greater importance for an institution to contribute directly to this intellectual debate by teaching its own ideas. Thus not surprisingly, around the world, excellent universities highlight research as one of their most distinguished and competitive strengths. The Faculty of Veterinary Science at the University of Pretoria, in general, is no different in following this ideology. We view all knowledge generated through our research initiatives as a cornerstone to the sustainable development of our country’s economy, the social development of all South Africans and our contribution to a globalised society, especially one built on international trade policies. Through these efforts, the life of the average person can be improved from the benefits of better nutrition, improvements in family disposable income and ultimately in the growth of the African and global agro-economy. Another important aspect for a University is to be among the top tertiary research institutions in the world. The reason for this is that this process not only provides impetus to the global sustainable development goals but allows for the global movement of researchers and students with the spread of ideas but also creating opportunities for globalised solutions to problems. It should thus not be surprising that is one of the Faculty’s strategic aims to continuously strive to improve the quality and impact of our research to further our international recognition and continue to be acknowledged as such. In this regard, the Faculty is exceptionally proud of its achievement in being ranked 30th among the top 200 veterinary institutions worldwide by the Shanghai rankings in 2017 and 37th in 2018. More so, the faculty is pleased to link these achievements to the hard work and dedication that our post-graduate students place on achieving their study goals. By joining us for your post-graduate studies, you will be entering an environment that values critical thinking and will allow you to become an effective researcher in an area of your choosing. By joining the Faculty of Veterinary Science, you will also be given the opportunity to work alongside your study leaders while being mentored as future researchers and for Master’s candidate the opportunity to enter into a PhD programme. ** Prof Vinasan (Vinny) Naidoo was appointed as new Deputy Dean: Research and Postgraduate Studies of the Faculty with effect from 1 August 2015. Prof Naidoo obtained a BVMCh degree at Medunsa, and an MSc degree and PhD degree at the University of Pretoria. 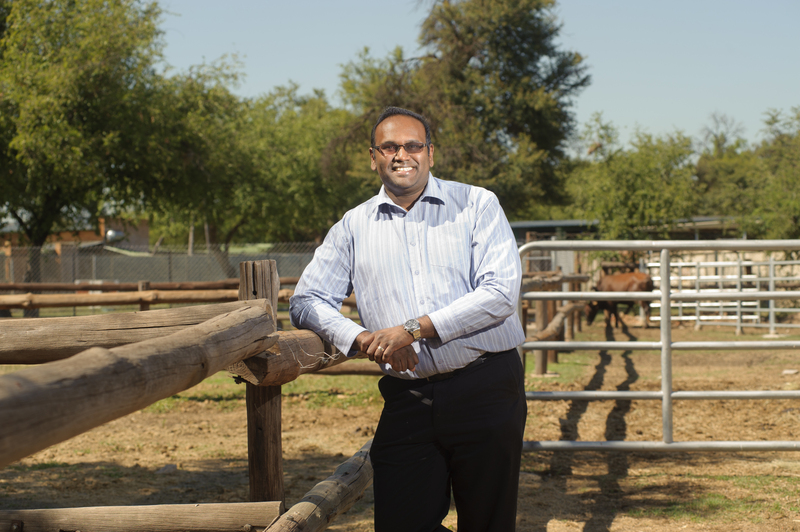 He is also a registered specialist veterinary pharmacologist with the South African Veterinary Council (SAVC). He commenced his career as a lecturer in Veterinary Pharmacology in the Department of Paraclinical Sciences in 2002 in the Faculty, where he progressed to associate professor and then professor and Director of UP's Biomedical Research Centre (UPBRC). Among other things, he was elected as an Exceptional Young Researcher of the University in 2009, and as Young Researcher of the Year in the Faculty in 2007 and Researcher of the Year in the Faculty in both 2009 and 2013. Prof Naidoo has been serving as an expert committee member of the Medicines Control Council (MCC) since 2003, and has been a full member of the Council since 2010. He also serves as Chairperson of the Educational Committee of the South African Veterinary Council (SAVC) and is the Chairperson of the Board of VulPro (Vulture Programme). Prof Naidoo has supervised a large number of master's and doctoral degree students to completion. He has published extensively, both in peer-reviewed journals and book chapters.